Well made. Can be used vertical/horizontal. 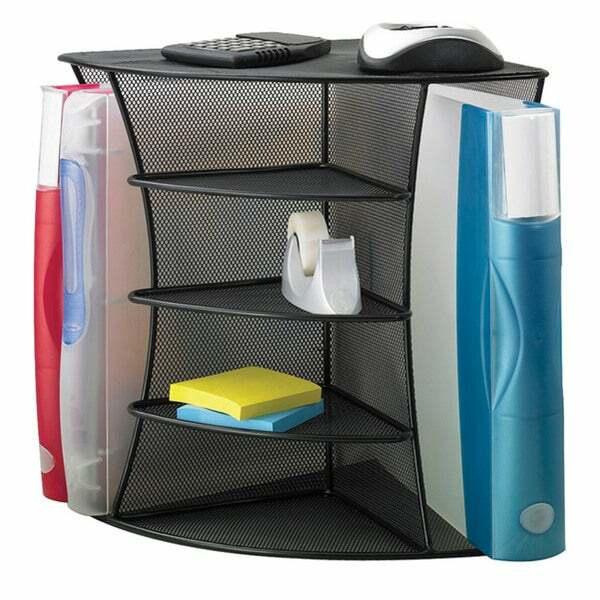 This black desktop organizer is great for holding binders, notebooks and file folders. This product features a mesh steel construction and fits well in a 90-degree corner. This desk organizer was a HUGE help organizing the top of my desk and it fits perfectly in the corner. I was surprised at how much stuff I could fit in all of the little shelves. I use it for personal use at home and I would definitely recommend this product to others who are looking to get their things in order. Great organizer for a corner. The upright section for paper is so much better than trays, this saves space. THe tiered levels are great for little things that otherwise clutter your desk. Very happy with this, it is a very good size, big enough but doesnt crowd your desk. I really like how this sits in a corner. It really helped organize my desk. It is very sturdy and I like the mesh design. Fits perfectly in the corner of my desk! I can't get over how great it looks. It's a little pricey, but I'm very satisfied with my purchase. I do recommend measuring the corner first, though, as it might not fit quite so perfectly as it did on my desk. Nevertheless, this organizer is practical, good looking, fits my requirements perfectly, and is really quite clever. I should also mention it arrived in less than 48 hours! I couldn't be happier this great buy! Solid & sturdy without being bulky, holds a ton of stuff. Compact but well designed to hold different categories of paperwork. I can now leave receipts, accounts payable, and other mateerials divided, and neatly ready to enter into the computer. Perfect, sturdy shelf! Works just great for the corner and is a good size without being bulky! Organizing my desk top at work.